Reviews are coming in: You like it! 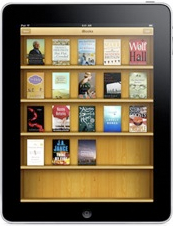 @natosaichek I bought 3 copies, and now I’ve downloaded the free PDF! 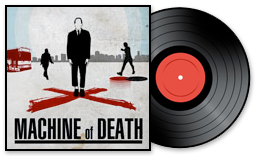 Can’t get enough #MachineofDeath. 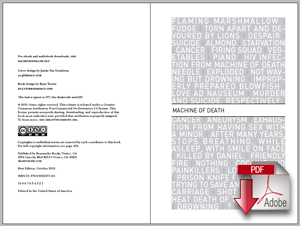 @jenniferbrozek Also, started reading “Machine of Death” edited by North, Bennardo and Malki. It is an amazing collection. Got it for free, going to buy it. @treelobsters My 12-year-old finally relinquished control of #MachineOfDeath. I never had this problem when he was into Dr Seuss. 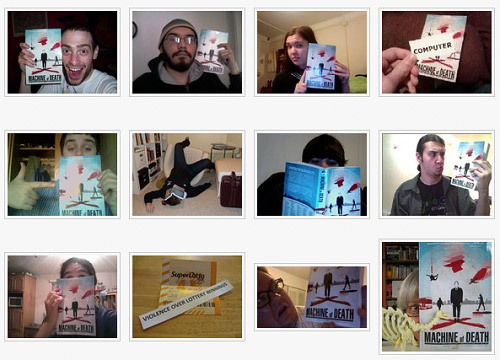 @LordCleverpork I want to thank @malki, @ryanqnorth, and all the contributors to #machineofdeath. It was a wonderful, and amazingly varied, read. I remember wishing when I read the original Dinosaur Comics comic that started it all that the book would be made. As a fan of science fiction short stories, I couldn’t have been more impressed. The many authors’ various idea[s] on such a world and society’s changes are astoundingly brilliant, witty, and imaginative. I have yet to read a more brilliant collection of stories, thanks in large part to the amazing concept they are all based on. The ideas of possible uses for such a machine are incredible… I can already tell this is going to be my favorite book for years to come. I read the first few stories aloud to my twin sister, numerous friends have asked to borrow it when I’m done, and I’ve recommended it to pretty much everyone I’ve talked to since picking it up. I read the paperback version a few days ago, and it was great. I disliked only 1 or 2 of the stories in the entire book, which is quite the feat for an anthology like this. There’s a story in here for everyone, and all are well-written. The editors did a great job, and the artwork is a great touch. 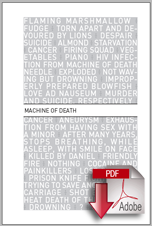 The concept is great, and it is amazing how each author takes a unique look at how a Machine of Death would affect life. The book ranges from pure comedy gold to incredibly inspirational stories to intensely debate- and thought-provoking ideas. Machine of Death is a new favorite of mine. This is it, guys. This is what we were after. This is what we were trying to prove to the publishers all those years. We’re so glad you like it — this whole enterprise isn’t about marketing gimmicks or bestseller-lists, really. It’s about getting all this great work by incredibly talented authors into the hands of people who will enjoy it. Thank you for helping us make that happen. Here are some more reviews we’ve found. We’re trying to collect as many as we can, so if we’re missing any, or if you see new ones, please let us know! Leave a comment or email us. Thanks! “NOT WAVING BUT DROWNING,” by Erin McKean. Read by the author. Everyone knows that the fourth day of ninth grade is when you get your results. I mean, that’s the way it happens in our town; other towns do it differently. Amy, who moved here from Atlanta, said that in the big cities they do it when you’re born, since they have to take blood from babies, anyhow, to test for HIV and that disease that means you can’t drink Diet Coke. (She says she’s going to be shot in a botched robbery, but I think she’s lying. She also said her aunt is on Days of Our Lives, and I don’t believe that either.) But here, in our town, all the parents got together and decided that they just couldn’t take knowing before we were at least in high school. Tim K. says it’s because when you’re in ninth grade, your parents find you so annoying that they can actually bear to think about you dying. Allycia thinks it’s because when you’re our age you think you’re immortal and they want to scare it out of us. That might have been true for our parents, or our grandparents, but I don’t know anyone our age who hasn’t always known that they’re really going to die. Update: See Carly Monardo’s great illustration for this story!